Nepali Patro is a popular calendar app in Nepal, with a slogan of �Hamro Samaya, Hamro Gaurav�. While most smartphones have pre-installed calendar app but they are not equipped with features you need. And also they don’t support Nepali dates (Bikram Sambat), events and holidays which is a cool thing about the Nepali Patro. There are many surprising features that this app can outperform other calendar apps in the list. Nepali Patro is historical nepali calendar which uses lunar and solar side real year. Nepali calendar uses the Bikram sambat system. The Rana rulers of Nepal made Vikram Sambat the official Hindu calendar in 1901 CE, which started as Samvat 1958.�In Nepal, the new year begins with the first day of the month of�Baishakh, which usually falls within the months of April–May in the Gregorian calendar.� Nepali calendar is 56.7 years ahead of the gergorian calendar. As before, from 2007 AD Nepal Sambat was recognized as the national calendar. There are 12 months in Nepali calendar and the length of each month is defined according to the time sun takes to move through a full zodiac sign. We will be listing important dates and days for your convenience here in the article below. Government has cut off many holidays from this year. The list below is the updated one. In our previous articles as well we have given full details on National holidays and occasions. Following is the download link of Nepali Patro calendar app for Android phone. What is the use of calendar app without out the feature of adding an event to it?Nepali Patro supports adding an event on a Nepali Date. The feature is called, My Events and you can write a short and sweet name of the event, Repetition of the event and set a Reminder notifications to it. Created events can be edited, deleted and disabled. A bonus point is you can turn on a cloud sync with Google, you just need to sign in your Google account for that. It is cool app when we find a small tool that allows us to gain something out of the way. 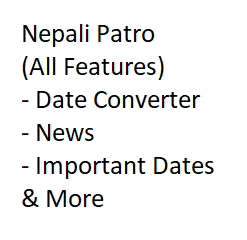 Nepali Patro has a small tool called Date Conversion. A user of the app can convert the date from B.S TO A.D or A.D to B.S. A good example for this is; it is useful when we want to know our birthday date in English date (in A.D). What is your Zodiac? What’s your Rashi? Rashifal is a fun thing to see. The Nepali Patro app supports daily, weekly, monthly and yearly for respective notifications and updates about the Nepali Horoscope. Foreign Exchange can be reviewed in the app. There is a wide range of currency to look for. Some of them are US dollar, European Euro, Swiss Frank, Malaysian Ringgit and Qatar Riyal. Most of the Nepalese people want their event to happen in a better way, better day. So we choose a day called Saits which is good for that event. Like for weddings and marriage we choose marriage Saits, called Biwaha Saits in Nepali. There are other Saits like hom, Rudri, Pasni, Pasal, and so on. People believe that if they start or perform the work or say that event took place at the moment (Saits) they are blessed and they become successful in the respective thing that is done. Nepali Patro Blog includes the articles and information from Nepali Patro. They write about festivals, the new year, celebration days like Valentine’s day, etc. News is an amazing feature in this app where you can read all the breaking and trending top stories happening in Nepal. You will be notified about the current affairs by the app even if you are not using the app. All the events and information are collected and displayed from the popular news portal of Nepal such as Nagarik News, Online Khabar, My Republica, BBC Nepali, Gorkhapatra and so on. Nepali Patro is a robust Nepali calendar app developed by Nepalese. The smarter and friendly design of the app lures anyone who uses it once to use it twice and more. A swipe-able function helps to find things and use the app easily.